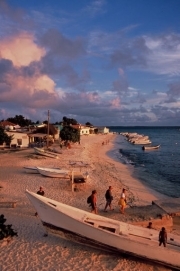 Situated 80 miles off the coast from Venezuela’s capital Caracas is the island of Los Roques. This small island has access to some of the most productive saltwater fly fishing in the Caribbean. There are extensive sand flats and beach flats, channels, cuts, coral shallows, mangroves, and massive muds created by hundreds of feeding fish. Los Roques is a wading paradise for the bonefisherman.